Happy Memorial Day! I hope you all get a chance to enjoy your day off and spend some time with friends and family. The weather went from 40 degrees and rainy to sunny and warm, so I’m excited for some delicious grilling and time in the sun. Obviously, I’m going for the food first. All of the chaos has finally started to die down! AP tests are over, my jury is over, so I finally have some time to get back to baking! I’ve missed being in the kitchen, but I wanted to be sure you weren’t left dessert-less for Memorial Day! If you don’t already know, my mom has started her own web-zine called The Weiser Kitchen, so I’ve been helping her out by baking. It clearly took a lot of coercing. These cookies were one of the recipes, and when they turn out this well, I’m more than happy to help! As you can probably tell, I love cookies. But, because I make so many cookies, I’m always looking for cookies that have something special about them, and the texture in these immediately stood out to me. I love cornbread and the rough, course texture that cornmeal has, so I was interested to see how it would fair in a cookie. It was a great investment! The course cornmeal paired with the pop of fruit from the current was just great. Cornmeal comes from corn, so these cookies are even a vegetable! Okay, maybe not. You should still make them! Preheat the oven to 350 degrees and prepare 2 cookie sheets. In a medium sized bowl, whisk together the flour, cornmeal, baking powder, and salt. In an electric mixer, cream the butter and the sugar until fluffy. Add in the egg and the vanilla extract. Mix in the dry ingredients until just combined. Stir in the currants. 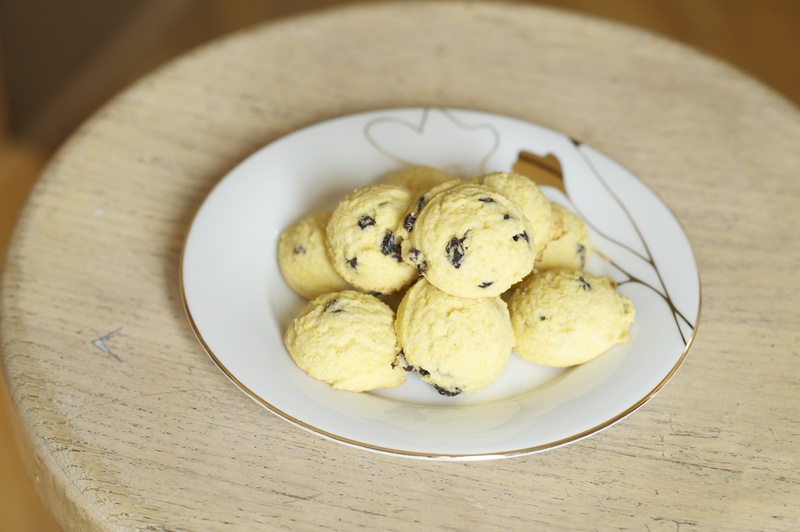 Using a tablespoon or small ice cream scoop, evenly drop the dough onto the cookie sheets. Bake for 8-12 minutes, or until the bottom is golden brown. Now make these cookies and enjoy the day off!